Never has this been more true than in the case of Sarah McKinley, a young Oklahoma mother who recently defended herself and her infant child from two individuals who broke into her home looking to commit the worst kind of violence. Ms. McKinley didn’t fight off these violent thugs with a knife or a broom, she used a good old fashioned shotgun to protect herself. You might have something similar in your home right now. I know I do. I have a strong-held belief that you have a God-given right to defend yourself, your property and your family -- and you shouldn’t have to ask the government for permission to do so. The Second Amendment is just that simple. You and I have “the right to keep and bear arms” -- period, end of story . I’m not sure how familiar you are with the National Association for Gun Rights (NAGR). If you are not, let me introduce myself and the organization I spend every day of my life leading . 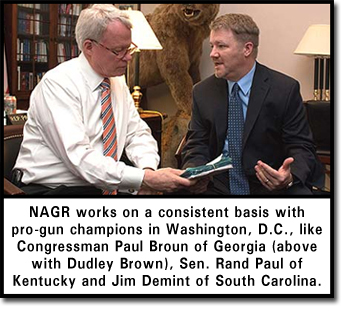 . .
My name is Dudley Brown and I am the Executive Director of NAGR. I have fought for the Second Amendment rights of individuals like Sarah Blanchard for more than 20 years. During that time, a few passionate defenders of our Second Amendment rights and myself joined together to form the National Association for Gun Rights. As I type this, NAGR counts nearly one million members and supporters, forming the fastest-growing and second largest gun rights organization in the country. Patriots like Sarah McKinley epitomize the type of folks who make up the National Association for Gun Rights. I know this for a fact, I’ve met thousands of our members and supporters -- personally -- at guns shows, conferences and banquets. You see, when I hear statistics like the fact that 90 million Americans own firearms, it warms my heart. Many of those 90 million are folks just like you and me who know that there is no better personal protection than ourselves. With all that positive, warm and fuzzy news, I do have some bad news. The right to defend yourself and your family has never been under greater attack. I’m not talking about a few radical left-wingers throwing pebbles at us on the playground. I’m talking about billionaires with tanks and machine guns. 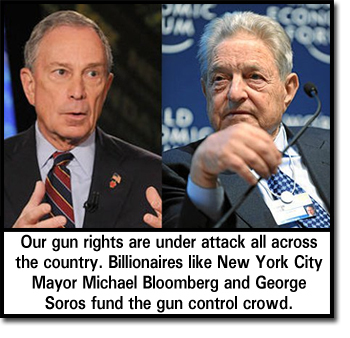 Our opponents are well-funded and well-armed. Well, maybe they don’t literally have tanks and machine guns, but they do have money. And lots of it. After all, those who are seeking to take our Second Amendment rights away are funded by the likes of George Soros and billionaire New York City Mayor Michael Bloomberg. But I never lose sight of the fact that there are more of you and me than there are of them. If they want a battle, we’re ready. If they want to take away my right to defend myself and my family, I’m going to be standing in the gap. 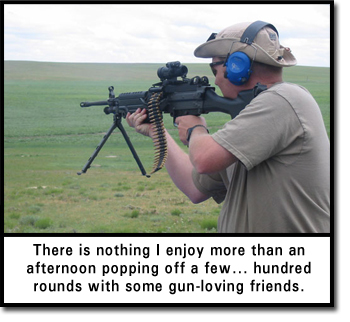 That’s what we are all about here at the National Association for Gun Rights. You and I are the last line of defense, just like Sarah McKinley was the last line of defense for her and her child. I want to thank you for giving me a minute or two to explain why the National Association for Gun Rights is so passionate about defending our Second Amendment rights. No, we aren’t inside-the-beltway lobbyists perched high above Washington, D.C. in a multi-million dollar crystal palace headquarters. This organization is made up of folks just like you -- patriotic Americans who don’t mind rolling up your sleeves and taking a bare knuckle approach to defending our rights and liberties. Please check NAGR out at www.nationalgunrights.org.